We started our “Up North” vacation on Tuesday afternoon. J worked her morning shift and when she got off around 11:00, we hopped in the car and started heading to Petoskey. We took a detour in Rockford to get lunch at Rockford Brewing Company so it put us in Petoskey at almost exactly 5:00. We rented at cabin at Petoskey RV Resort on the west side of town and the first thing we did was unpack the car then hit the pool. Our plan for the evening was to swim for a while, pick up a pizza, then find a spot to watch the sunset. We did the swimming and we actually passed a good spot on our drive from Charlevoix to Petoskey…so all that was left was to find a pizza place. I didn’t find many local places when I did a search for pizza. The one place that did come up came up rated pretty highly. That was good enough for me. 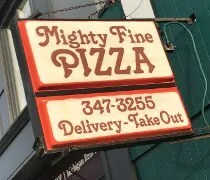 Mighty Fine Pizza has been in downtown Petoskey since the mid-1960’s. It really doesn’t look like it fits in the landscape on Mitchell Street just north of US-31…actually, let me rephrase that, it looks like it fits like a glove wedged into a space where there shouldn’t be a building. The small, take-out or delivery building is just eight feet wide…about the size of an alley…which is exactly what used to be in that space. I put in an order for two medium pizzas as we were getting ready to leave cabin and head downtown. The guy who took my order, had to put me on hold three times, told me it would take about 20 minutes. I got there 30 minutes after I ordered and still had to wait another 10. They were slammed on this Tuesday night and the kids taking the order kept apologizing saying they weren’t usually like this during the week. There’s not a lot of room inside the building. As I mentioned earlier, it’s only eight feet wide and the kitchen takes up almost the entire building. 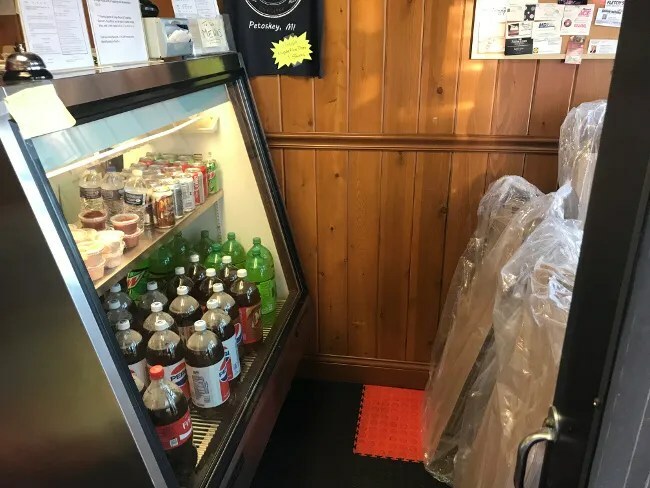 There’s just enough room to stand between a cooler holding pop that the order takers use as a table and the wall. There’s no real waiting area and since I was the only one waiting, I just stayed inside and tried to stay out of the way. I grabbed my pizzas and asked for a couple of paper plates then we made our way back west on US-31 towards Charlevoix to watch the sunset. I noticed a roadside park that looked like it was close to the water and would be a perfect spot to watch the sun go down. Turns out, I was right. Lake Michigan Shores has tables, trash cans, restrooms, and, even better, a perfect view of a gorgeous Pure Michigan sunset. We hauled all of our stuff to the tables and I started dishing out pizza. I went right for the medium pepperoni right away. The crust is hand stretched thin crust, but they leave a pretty big handle on the end to hang on to. The sauce was put on pretty thick. It didn’t have much of a flavor outside of a slightly sweet tomato…which I guess is what you want in a pizza sauce. 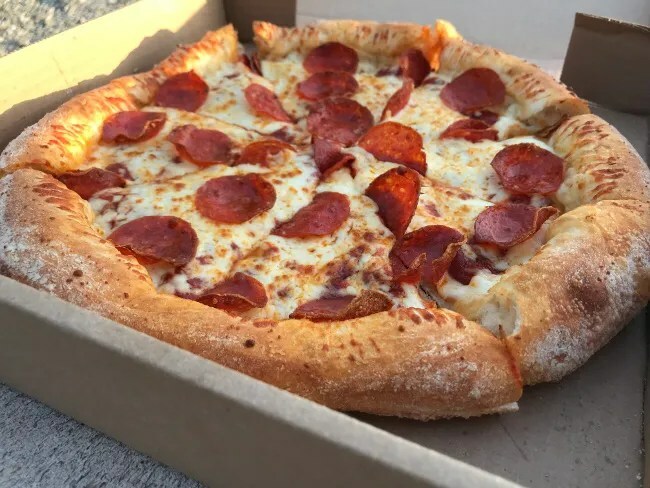 The cheese was put on in a slightly thinner layer and the pepperoni had deliciously crispy edges. 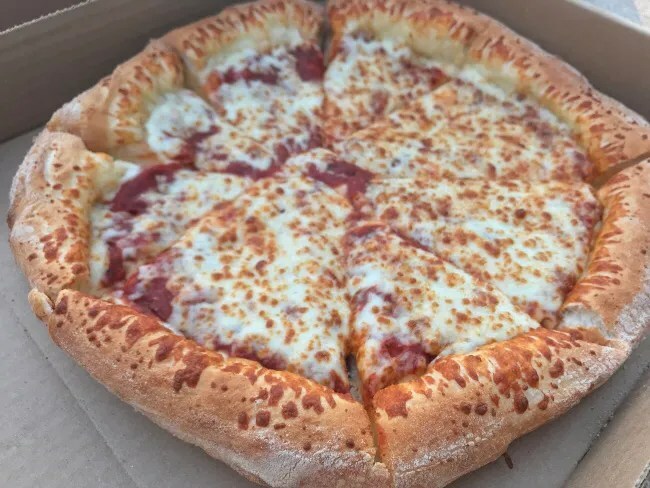 The cheese pizza was exactly the same minus the pepperoni. Not have the grease from the pepperoni gave a cleaner taste of that home made tomato sauce. J and L really went to town on this one. I picked the box up to combine the two pizzas and the cheese box was empty. L said she really liked it…which is why she kept going back for more. The cost for two pizzas was a little over $22. In a land of chain pizzerias, Mighty Fine has the market pretty much cornered on local delivery pizza places. 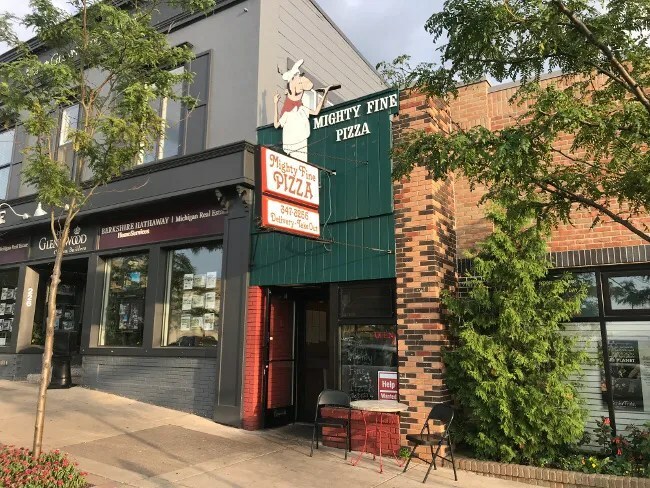 Pizza was the only thing we in the market for on our first night in Petoskey and as soon as I saw this place, which has been downtown for decades, I knew we were going to order from them at least once.